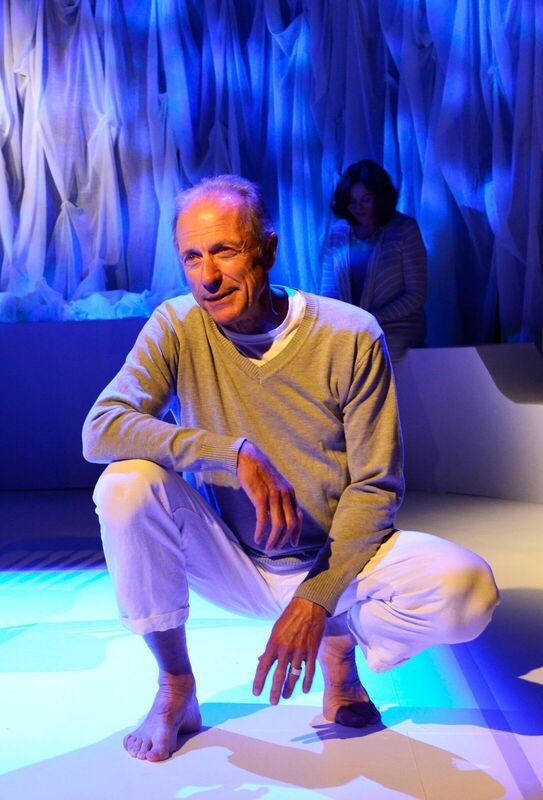 Renowned playwright Israel Horovitz has a new play at LaMaMa. Barefoot Theatre Company and Compagnia Horovitz-Paciotto present Gloucester Stage Company’s production of Man In Snow. The author directs this moving work, which has been adapted from his radio play for BBC 4. David (Will Lyman) is back in Alaska to lead a group of amorous young Japanese couples who want to climb in Denali National Park. Folklore has it that a child conceived next to the highest peak in North America, under the Northern Lights, will grow up to be vigorous. While David doubts this story, he and his wife Franny (Sandra Shipley) have been to Denali before and he has returned several times. So has Mr. Takayama (Ron Nakahara), very sprightly for 89 years old, who admits that many of his twelve children were conceived at Denali. David frequently speaks on the phone with Franny, and they appear very much in love after more than forty years of marriage. David’s friend Connie (Paul O’Brien), who is also climbing in Denali, tells David that Mr. Takayama and his recently deceased wife spent a great deal of time there. David, whose son Joey died in a motorcycle accident a few years previously, connects with Mr. Takayama and they simultaneously grieve and appreciate their lives. It is almost as though the time spent in nature is their real existence, and the intervening time disappears. The gentlemen may seem a bit self-absorbed, but indeed David talks to an apparition of his son Joey (Francisco Solorzano) and Mr. Takayama scatters his wife’s ashes on the slopes. Perhaps the separation from urban life was necessary for everyone to be at peace. Flashbacks show the devastating effect of Joey’s death on his family, including Franny’s emotional withdrawal and David’s finding comfort with another woman. However, as David calls his daughter Emily (Ashley Risteen) on the night before her birthday, father and daughter finally become close. Could it be that no one could come between David and Joey, and that the younger, more accomplished daughter was disrespected? This play contains much introspection. Even when an act of nature isolates David from the rest of his group, he calls Franny and talks sweetly to her through the night. Jenna McFarland Lord’s set is a beautiful stark white, to which Niluka Hotaling’s lighting adds the brilliant Aurora Borealis. The non-linear storytelling is very interesting and I got the impression that the characters who were not in a particular scene were observing and listening to the action. Franny, who like Emily works in publishing, is always reading stories and even has dreams about them. This play also connects the world of the living and the world of the dead, despite the opinion of Connie that you only get one shot at life. Those who are looking for a testament to lifelong monogamous love will certainly appreciate this show and the emotionally conversant characters. Mr. Takayama’s endorsement of the old-fashioned Japanese extended family living arrangement is also beautiful.